File photo. 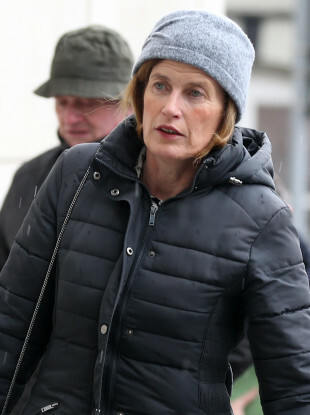 Mary Lowry arriving at the Criminal Courts of Justice. GARDAÍ INVESTIGATING THE murder of DJ Bobby Ryan found evidence of blood stains in the sitting room and bedroom of his girlfriend Mary Lowry’s home, the Central Criminal Court has heard. Retired detective John Grant said the stains were sent away to be analysed by the forensic laboratories. He was giving evidence in the trial of Patrick Quirke (50) of Breanshamore, Co Tipperary who has pleaded not guilty to the murder of Bobby Ryan, a part-time DJ going by the name Mr Moonlight. Ryan went missing on 3 June 2011 after leaving Lowry’s home at about 6.30am and his body was found in an underground run-off tank on the farm owned by Lowry and leased by the accused at Fawnagown, Tipperary in April 2013. The prosecution claims that Quirke murdered Ryan so he could rekindle an affair with Lowry (52). Grant told David Humphries BL for the prosecution that Lowry’s home consisted of three en-suite bedrooms, a living room, a large kitchen and an extension where Lowry’s mother-in-law lived. On 3 May 2013, gardaí used forensic equipment to identify areas of blood not visible to the naked eye. In the sitting room they found evidence of blood on a light fitting and on the ceiling. They took the light fitting away for further testing. In the bedroom they found positive reactions to the blood testing equipment on the bed frame, mattress and floor. The following day gardai returned and found “directional blood spots” on the inside of a wardrobe. Gardaí swabbed panels of the wardrobe and removed the doors for further testing. The results of tests carried out by the forensic laboratories have not yet been given in evidence. Gardaí also searched eight out-buildings on the farm and a Toyota Corolla car but found nothing. Tests carried out on the accused man’s vehicle also showed no positive results. Grant said he was present when Dr Khalid Jaber carried out a post-mortem on Ryan’s “badly decomposed body”. The former Deputy State Pathologist told him that Ryan’s injuries would have caused death within minutes and therefore he believed he was dead when he went into the tank. He noted that the deceased had suffered multiple blunt force trauma injuries, primarily to the face and the side of the head with further injuries to the ribs and one leg. Under cross-examination Grant told defence counsel Lorcan Staines SC that he was there when a concrete lid covering the tank was removed by a JCB. He said his main concern was that nothing should happen to the body and he was watching closely when the slab broke, releasing dust and small pieces of concrete into the tank. The witness said no damage was done to the body and he therefore did not make a note of it and didn’t include the incident in his statement. He said he doesn’t remember if Dr Jaber, who did not attend the scene, knew about the broken slab but he said the pathologist had access to photographs taken by a garda photographer. Those photographs, he said, showed the slab breaking and it would be normal procedure for a pathologist to look at all photographs when they have not attended the scene. The witness was also pressed on why Dr Jaber did not attend the scene. He said that pathologists decide which scenes to attend and it was his decision. Grant further detailed the moment a member of his team accidentally removed one of Ryan’s arms as they attempted to place the body in a body bag. He said the member suffered an adverse reaction and was referred to the welfare service as a result. The trial continues tomorrow in front of Justice Eileen Creedon and a jury of six men and six women. Email “Gardaí found evidence of blood stains at home of DJ Bobby Ryan's girlfriend, court hears”. Feedback on “Gardaí found evidence of blood stains at home of DJ Bobby Ryan's girlfriend, court hears”.